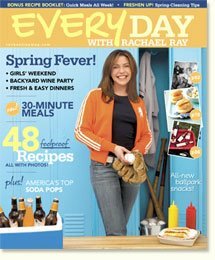 Everything Rachael Ray: Every Day with Rachael Ray Selling Like Gangbusters! Every Day with Rachael Ray Selling Like Gangbusters! Every Day with Rachael Ray. It's the only magazine I subscribe to that I don't pass on to a friend or throw away after reading (I hate clutter). Although, I do cut out recipes I like and put them in my recipe binder, so at least I don't leave the magazine in its pristine condition when saving it. Reader's Digest Association is doubling its rate base this year for its new food mag, Every Day with Rachael Ray, Mediaweek reports. Every Day launched in October with a $3.99 cover price. With the April/May issue, Every Day's guaranteed circulation will go from 350,000 to 450,000. With the October/November edition, it will go up to 750,000. RDA initially distributed 600,000 copies of the premier issue, but increased the print run by another 100,000 issues in November. How exciting that so many people have enjoyed the magazine. I have tried several of the recipes in it and none have disappointed so far. They have done a good job of capturing Rachael Ray's point of view.